What if paying by credit card is your only option? 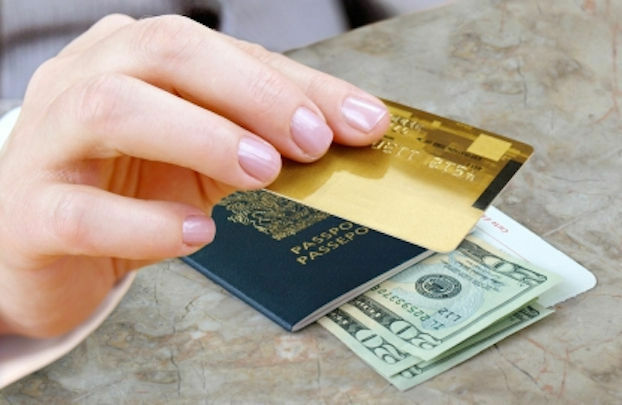 Foreign transactions require travelers to be armed with currency and plastic. Trying to get train tickets at Schipol for a sightseeing layover in Amsterdam? Need some fuel on a Sunday for that south of France road trip? Hoping your teens studying design in Denmark can bring home some presents? Normally, it is simple enough to make standard purchases on vacation, but many Americans abroad are having their charge cards declined. The latest security standard, EMV uses a a dynamic authentication methodology which is specific to the transaction only and is subject to change at the new transaction. Since it’s universally acknowledged as the better product, travelers will find that the newest technology used in foreign countries, such as automatic card processors in train stations, metro stations, gas stations without attendants, vending machines, etc. will not accept major American charge cards without the EMV or chip-and-PIN technology. Retail businesses don’t want to alienate good customers, and Americans are the world’s second biggest travel spenders (behind Germany) per the UNWTO. Yet, travel blogs and forums share humiliating tales of Americans who must beg local citizens to borrow a charge card… then reimburse them with cash. Fortunately, the newest chip-and-PIN readers in shops either accept both types of cards as long as there is a PIN associated with them, or enable vendors to manually input the needed security clearance for any card. Are there options? Many American banks are slowly moving toward cards with chip-and-signature functionality. The MasterCard Chip card is one new product; their World Elite Card and MasterCard World Cards offered through several banks also provide traveler perks like identity theft resolution and even some basic travel insurance coverage. With its 24/7 on-call concierge service and the Priceless Cities program, travelers get assistance with hard-to-find tickets and tours, news of upcoming events, and the inside scoop on what to see and do. Visa works with JP Morgan Chase to offer a variety of chip-and-signature cards and several don’t charge foreign transaction fees, another bonus. US banks are adding the smartchip part without encoding PIN identity verification, so that use of these cards still requires a verified signature. However, these newer cards are much more likely to be accepted abroad. Until such time as American banks comply with best practices for financial security, those with a magnetic strip credit card still have a few options. Cash Passport, from MasterCard and Travelex, is a prepaid foreign “currency card” with the chip-and-PIN technology designed just for American travelers. It comes in Euros, GBP and US dollars; however, the exchange rates charged by Travelex are significantly higher than you would pay for transactions charged on a normal credit card. Travelex does assure consumers that the card is backed by 24/7 Global Emergency Assistance and can be replaced within 24 hours in the event the card is lost or stolen, making this a good option for your students. For cash needs, we recommend that you withdraw local currency from the ubiquitous local ATMs using your bank cards (all of which do require a PIN). Bank ATMs are the safest technology on a security level. While a cash withdrawal triggers an ATM fee, the exchange rates charged are close to the current published rate. This is absolutely the most economical way to get money. To minimize the ATM fees — the ATM fee is the same whether you withdraw 20 euros or 200 euros — withdraw larger amounts and keep excess funds in your hotel safe. Changing cash or traveler’s checks at the airport is the worst currency strategy possible. It will cost you! There is always an ATM machine available after you clear customs/immigration. However, if it’s a Travelex or other private exchange machine, just get a small amount or change some dollars to local currency at the exchange counter, but just enough to get you going. You can save later on down the road. Iâ€™ve seen progression in every post.